With 7,000km of coastline, 2 million hectares of rainforest, more than 150 desert islands and the Great Barrier Reef sprawling offshore, Queensland has some the best of Australia’s natural wonders. The Whitsundays, a chain of 74 islands discovered by Captain Cook as he sailed around the coast in the Spring of 1770, offer the holy trinity of holidaymaking – snorkelling, sailing and secluded beaches. 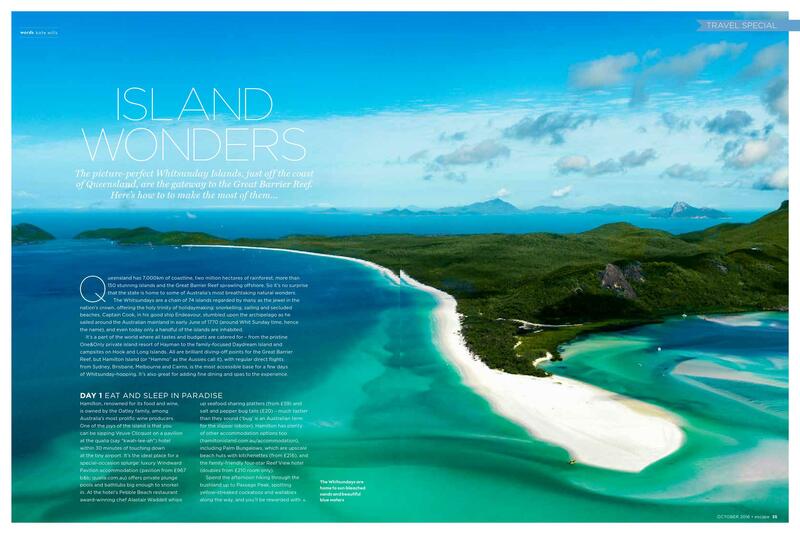 Only a handful of these tropical islands are inhabited, but they cater to all tastes and budgets, whether it’s the pristine One&Only resort island of Hayman, the family-focused Daydream Island, or the basic campsites on Hook and Long islands. 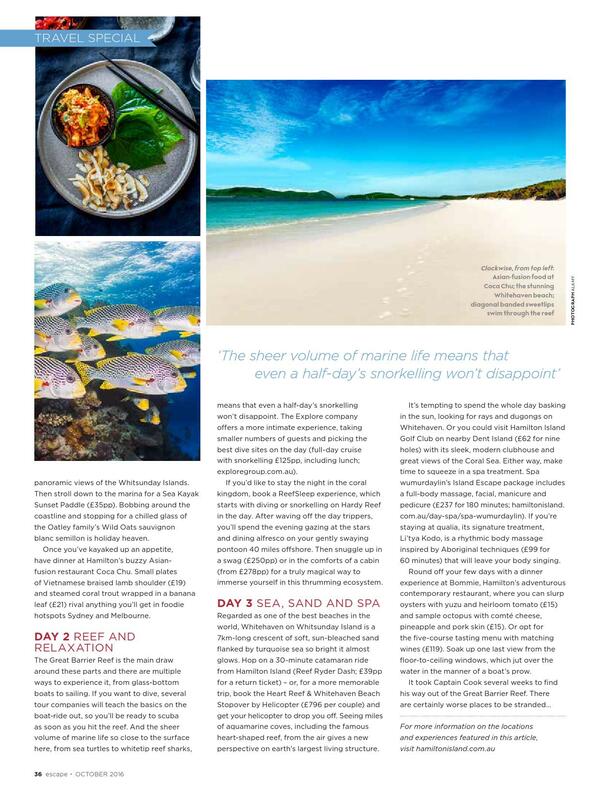 All of them make ideal diving off points for the Great Barrier Reef, but Hamilton, or “Hamo” as the Aussies call it, is the spot for fine dining and spa-ing, and with regular direct flights from Sydney, Brisbane, Melbourne and Cairns, it’s the most accessible base for a weekend of Whitsunday-hopping. Owned by the Oatley family – one of Australia’s biggest wine producers – Hamilton Island is renowned for its food and wine. One of the joys of Hamilton has to be that within 30 minutes of touching down at the tiny airport, you can be sipping Veuve Cliquot on the pavilion at Qualia. Pronounced kwah-lee-ah, this exclusive hotel is the place for a special occasion splurge, the best cabins boast their own private plunge pools and bathtubs big enough to snorkel in (from Â£512 a night, qualia.com.au). But Hamilton has plenty of other options too, such as Palm Bungalows – upscale beach huts with kitchenettes (Â£180 a night) or Reef View – a family-friendly 4-star hotel (Â£150 a night). Even if you’re not staying at Qualia, it’s worth making a reservation at Pebble Beach for lunch, where award-winning chef Alastair Waddell whips up seafood sharing platters (Â£57) and salt and pepper bug tails (Â£19) – much tastier than they sound, ‘bug’ is a local lobster. Spend the afternoon hiking through the bushland up to Passage Peak, which rewards you with panoramic views of the Whitsundays, spotting yellow-streaked cockatoos and wallabies along the way. Then stroll down to the marina for a Sea Kayak Sunset Paddle (Â£35 pp). Bobbing around the coastline with a chilled glass of the Oatley family’s Wild Oats Sauvignon Blanc Semillon is holiday heaven. Once you’ve kayaked up an appetite, have dinner at Hamilton’s buzzy Asian-fusion restaurant Coca Chu. Small plates of Vietnamese braised lamb shoulder (Â£17) and steamed coral trout wrapped in a banana leaf (Â£20) rival anything you’d get in foodie hotspots Sydney and Melbourne. For obvious reasons, the Great Barrier Reef is the main draw round these parts and there are multiple ways to experience it, from glass-bottom boats to “seabobbing” (a motorised float pulling you along the water). If you want to dive, several tour companies will teach the PADI basics on the boat ride out, meaning that you’re ready to scuba as soon as you hit the reef. But the sheer volume of marine life so close to the surface here, from leatherback turtles to white-tipped sharks, means that even a half day’s snorkelling won’t disappoint. Boutique company Escape take smaller numbers of guests and pick the best dive sites on the day (full-day snorkel Â£115 pp, including lunch). If you want to sleep with the fishes (literally, not Mafia style), book a ReefSleep experience, where you’ll spend the day diving or snorkelling on Hardy Reef, before waving off the daytrippers and having the coral kingdom entirely to yourself. Dining alfresco on a gently-swaying pontoon, before snuggling into a swag (Â£223 pp), or the comforts of a cabin (Â£250 pp), with only the stars and Nemos for company, is a magical way to feel immersed in this thrumming ecosystem. Regularly voted one of the best beaches in the world – Whitehaven on Whitsunday Island is a 7km long crescent of soft, bleached-out sand flanked by turquoise sea so bright it almost glows. You can hop on a 30-minute speedboat here, but for a more memorable trip, charter a scenic helicopter flight to drop you off (Â£100 pp). Seeing miles of blindingly-beautiful aquamarine coves from the air, including the famous heart-shaped reef, gives a totally different perspective of the largest living structure on earth. It’s tempting to spend the whole day on Whitehaven, looking for rays and dugongs in the shallows, while basking in some sunshine yourself. Or you could get the helicopter to drop you off at Hamilton’s golf course, nestled into Dent Island (Â£150pp including helicopter transfer). Either way, make time to squeeze in a treatment at one of Hamilton’s two spas. Li’Tya Kodo, the signature treatment at Qualia, means “melody” and is a rhythmic body massage inspired by Aboriginal techniques (Â£90 for 60 minutes) which will leave your whole body singing. Round off the weekend with dinner at Bommie – Hamilton’s adventurous contemporary restaurant – where you can slurp oysters and octopus (both Â£15), or opt for the five-course tasting menu with matching wines (Â£105). Soak up one last view from the floor-to-ceiling windows, which jut over the water in the manner of the prow of a boat. After discovering The Whitsundays, Captain Cook’s ship, The Endeavour, ran aground on the Great Barrier Reef and was stuck for seven weeks. There are definitely worse places to be shipwrecked.